Inside The Costume Box: Morphsuit revolution - Is This the Facepaint of the Future? Morphsuit revolution - Is This the Facepaint of the Future? You may have seen them cheering at the cricket, prowling the streets on Halloween, or dancing carefree at the latest music festival. The brainchild of 3 mates from Edinburgh, Gregor Lawson, Fraser Smeaton, and Ali Smeaton, the Morphsuit was inspired by a friend showing up at a Bucks party in a full nylon suit. The name came when 'we noticed that everyone who wore them morphed into a more fun version of themselves', says Fraser, 31. The full body nylon suits come in bright colours, prints, and country flags and feature a full zip up the back, anatomical fingers, and the ability to see, breath and drink through the material. 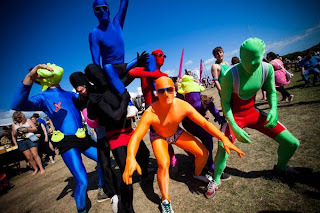 Officianados of the Morphsuit insist the form-fitting Lycra makes them feel like an action hero while maintaining anonymity that lowers inhibitions over wearing very little in public! The Morphsuit has definitely arrived with the first Morphsuit 'day' being celebrated worldwide this past September. (Don't worry, there's a group on Facebook in case you want to be reminded for next year!) 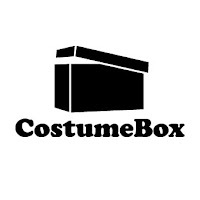 While the obvious choices for donning a Morphsuit are for sporting events and Bucks nights, adding a few accessories can make for endless fancy dress theme party ideas! 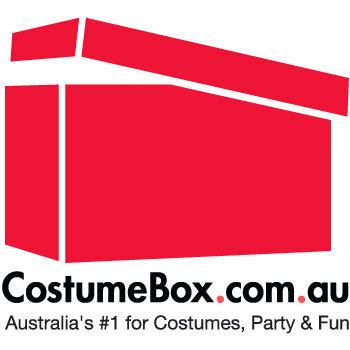 Check out the complete range of Morphsuits available online at Costumebox.com.au. Looking for ideas for Morphsuit costumes? Morphsuits 101: Read Before You Buy A Morphsuit! Amazing what you can do with a red Morphsuit and a little white fun-fur!